I recently had the opportunity to attend a press junket for The Croods, in Manhattan. The day included round table interviews with Nicolas Cage [the voice of Grug], Ryan Reynolds [the voice of GUY], Emma Stone [the voice of EEP] and The Croods co-writers / co-directors Chris Sanders and Kirk DiMicco. 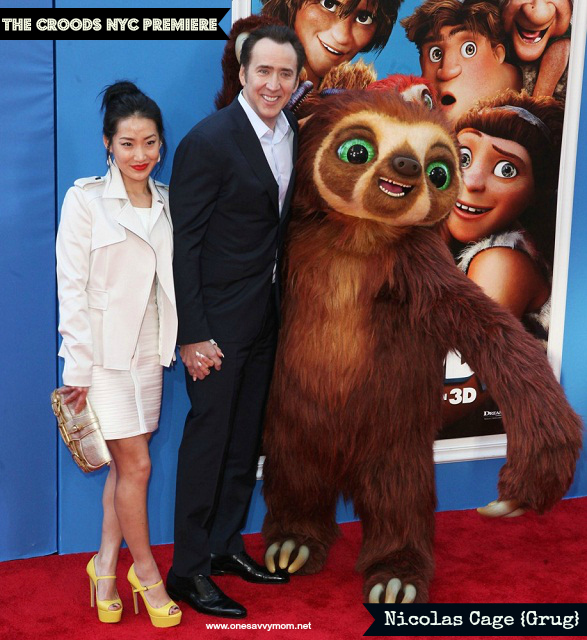 Nicolas Cage voices Grug, in DreamWorks' new Animated film, The Croods. 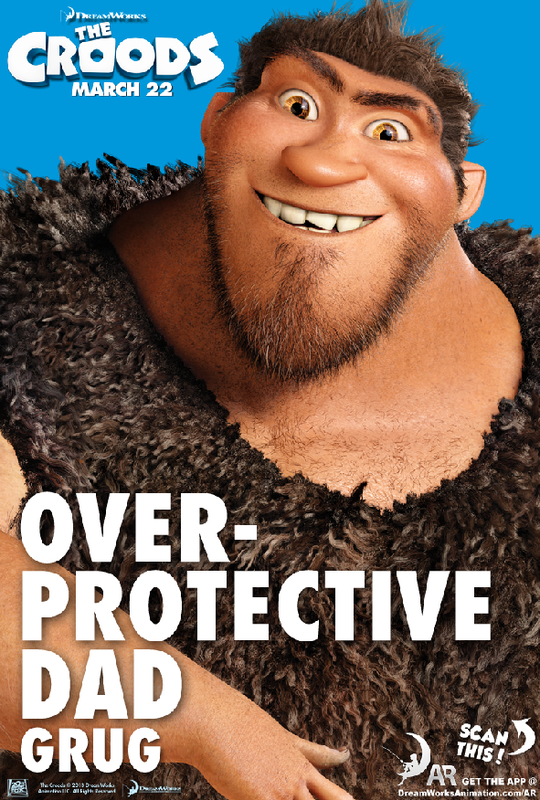 Grug is an overprotective [caveman] father. He teaches his family to fear everything and only finds comfort in routine and his familiar [cave] surroundings. Though a bit extreme and overly cautious, Grug has the heart of a loving father and he means well. At the end of the day, he would do anything for his family. In reality, Nicolas Cage is a father of two [boys], so we were interested to see if he could relate to his character's parenting style. While he is certainly a concerned parent, he does not take it to the same extremes as his character, Grug. "Without getting too personal, I do have those feelings at times of concern for my family and feelings of being protective. But, I like to think that I live my life in a way where I'm willing to take chances in my work and also in my life. So, in that sense, I don't relate to Grug because he's more surviving as opposed to living, whereas I do believe there's value in taking chances and exploring" said Mr. Cage. In The Croods, Grug is fighting a seemingly uphill battle; against the ever-changing World, his combative mother in-law [voiced by Cloris Leachman] and his adventurous [somewhat rebellious] daughter, EEP. He's trying to juggle it all, and for a guy who hates change, it's an awful lot to process! There are definite relatable parallels to be found in The Croods. The ever-changing landscape of parenthood [prehistoric and modern day alike] can be difficult to navigate. Nicolas Cage offered up some sage words of wisdom on parenting, that I couldn't agree with more! "I think the two most important things you can give to a child, if you want my opinion, are love and a good education. Those are the two most important things and a feeling of home and safety at home, that that's a safety zone" said Mr. Cage. Finding common ground to connect with our children, is also incredibly important. In The Croods we see Grug attempt to mirror Guy's pioneering/innovative ways [see clip above]. He wants his family to look at him with the same respect and admiration, as they do Guy. He wants to find a common ground on which he can relate to his family [mainly his rebellious daughter Eep]. Though Grug fails in some ways, he succeeds when it's most important. So, how does Nicolas Cage find common ground with his own children? In-part through his favorite Apps. "I like music. And I like movies, obviously. I need to keep current with what's happening now with film and also with music. I love classical music and also want to hear what's happening with the new rock music because my oldest son is immersed in that. So, it's something I want to keep up to date on" said Mr. Cage. Overall, Nicolas Cage was incredibly happy with his character [Grug] in this film and how the movie turned out. "I remember, years ago, there was some discussion about doing Shrek. And I didn't want to look like that. I didn't want to be the ogre. I didn't. Now, I maybe should have. But, I'm glad that Jeffrey [Katzenberg, CEO of DreamWorks Animation] thought of me again for this and, finally, we found the right one. It's been many years where the two of us have been trying to find the right match.And I must say I'm happy with this result. I like the quality of the humor in this film. I think it's humor that parents will be comfortable with their children copying. It's pretty wholesome humor. And so, I like that" said Mr. Cage. Agreed, The Croods is definitely a film that the entire family can enjoy! THE CROODS is a 3D comedy adventure that follows the world's first modern family as they embark on a journey of a lifetime when the cave that has always been their home is destroyed. Traveling across a spectacular landscape, the Croods are rocked by generational clashes and seismic shifts as they discover an incredible new world filled with fantastic creatures -- and their outlook is changed forever. Starring the voices of Nicolas Cage, Emma Stone, Ryan Reynolds, Catherine Keener, Clark Duke and Cloris Leachman. 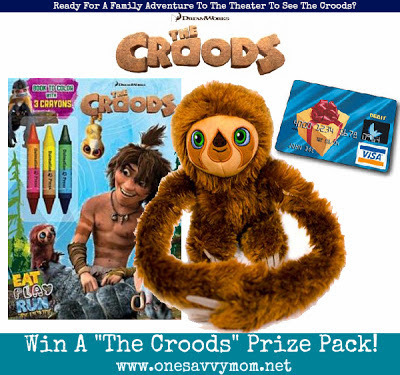 Keep up with The Croods!﻿ Visit the official website - Like The Croods on Facebook - Follow @DWAnimation on Twitter #TheCroods - Re-pin great DIY tutorials, printables & more from The Croods on Pinterest! Ready to see The Croods? (1) One Savvy Mom reader will receive a "The Croods" Prize pack! 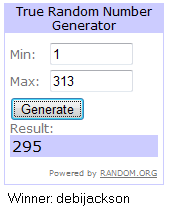 Prizing courtesy of 20th Century Fox and DreamWorks Animation.